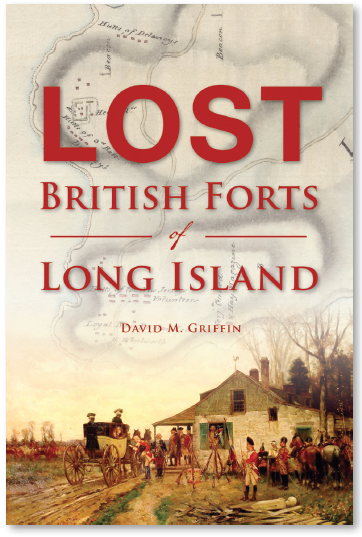 On Monday, August 28, at 7 pm, author David Griffin visits the Oyster Bay Historical Society to discuss his recently released book Lost British Forts of Long Island. The event is free and open to the public. Light refreshments will be served. Copies of Mr.Griffin's book will be available for purchase and signing. For more information, please call 516-922-5032. After the Revolutionary War broke out in 1776 and New York City had fallen, the forces of Great Britain developed a network of forts along the length of Long Island in order to create a defensive front against patriot assaults from Connecticut. Lost British Forts of Long Island uncovers the lost history and harrowing stories of these fortifications. A practicing interior and architectural designer, David M. Griffin conducts independent architectural research and investigation in the New York metropolitan area. Currently his work focuses on American colonial-era architecture and structures, as he looks to gain a greater understanding of architectural history's influence s on contemporary design. He lives with his family on Long Island's North Shore.